Is it a coincidence that Republicans Lindsey Graham and John McCain folded their spirited opposition to Chuck Hagel on the day they met with President Obama to discuss “Immigration Reform” — also known as, Amnesty, ask the analysts at Secure America.Org. And point out: This explains why McCain repeatedly declared Hagel not “Qualified” to be Secretary of Defense, while in the same breath, announced that he would drop his opposition to a vote on Hagel. That meant Hagel’s nomination would be approved because the Democrats control the Senate. Today, the Republican leadership, led by McConnell, Graham, and McCain, allowed the Senate to vote on Hagel. They did so even though Hagel refused to turn over critical information about his financial dealings — information that the Senate had previously demanded. These Senators allowed the vote to proceed so even though they asserted that Hagel is unqualified, and they believe that Hagel holds dangerous views on Iran, Israel, and the United States: Remember, Hagel is the man who described the United States as the World’s Bully. How can they be so critical of Hagel and then vote to allow him to become Secretary of Defense? How can they justify making this man Secretary of Defense? When Secure America Now confronted Senator McCain, he said that Senate protocol requires him to allow Hagel’s approval. McCain didn’t change his mind even after he was told that the Democrats stopped the nomination of Republican Senator Tower for the exact same position. But the immigration meeting with Obama seems to explain a lot. The American people should feel betrayed by all those Senators who supported a vote on Hagel and allowed approval of his nomination. This includes Democrats like Chuck Schumer, Carl Levin and Harry Reid, and Republicans, like Graham, McCain and McConnel. In dark times such as this, it is incumbent upon us, the “Ground Troops,” to set this country on the right course. During the Hagel and Brennan debates, we showed we can impact the system and slow down the Obama machine. We will continue to do so with your continued support. Senate confirmation comes two weeks after Republicans launched filibuster to block nomination for secretary of defence. The US Senate has voted to confirm Chuck Hagel to be the next US defence secretary. The vote on Tuesday was 58-41, with four Republicans joining Democrats in backing President Barack Obama’s nominee. The vote ended a contentious fight over the president’s choice for his second-term national security team. Hagel will succeed Defence Secretary Leon Panetta, who is stepping down after four years as CIA director and Pentagon chief. The vote came just hours after Republicans dropped their delay and allowed the nomination to move forward. The Senate voted 71-27 on Tuesday to end the debate and move forward, almost two weeks after Republicans launched a filibuster to block Hagel’s nomination. 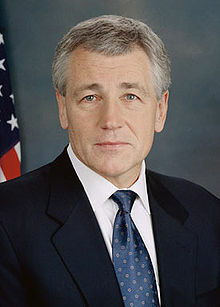 Many Republicans have fiercely opposed Hagel, a former Republican senator from Nebraska who angered party leaders when he criticised former President George W Bush’s handling of the Iraq war. But Democrats stood together for Hagel, a twice-wounded Vietnam combat veteran. This entry was posted in AfPak region, News and tagged Chuck Hagel, Republican Opposition, Vietnam war veteran. Bookmark the permalink.